Stay at a French American's home in Manhattan in a big apartment! You have a separate bedroom with private shower and toilets. You will have access to a large kitchen, a lounge and a dining room. My bedroom is in the other side of the apartment, so you can will find all the peace that you wish during your stay. The apartment is located just in front of the campus of the famous Columbia University, and a block away from a big park, the Riverside Park, which extends the Hudson River. The underground and the bus are a block away guaranteeing a quick access to all interest places of Manhattan. Many restaurants and shops as soon as you are out (including a supermarket open 24/24 in the building). The building has 3 lifts and one room for laundry. The apartment has Wifi Internet broadband and your bedroom has air conditioning. The apartment complex is located in Manhattan, in the Upper West Side, in front of Columbia University. You will be a one minute from a big park which extends the Hudson river, and 15 minutes walking away from the Central Park. The metro line (stop one block from de building) takes you to Time Square in 20 minutes. A bus at the foot of the apartment complex takes you to the Metropolitan Museum of Art and the Guggenheim in 30 minutes. Charming area with many restaurants and shops as soon as you get out of the building. The toilets, washbasin and shower are reachable only from your bedroom and are exclusively for you to use. We chose New York City to visit for our 60 Anniversary and selected this apartment based on the description on the VRBO site and positive reviews therein. We wanted a place where we could come and go from by using subway and bus connections throughout the city, have local shopping nearby with grocery, deli, restaurant, fast food and nearby walks to attractions. The location of this apartment turned out to be just the place we were wanted. We walked along the Riverside Parkway overviewing the Hudson River to Riverside Church , General Grant's Memorial, to Morning Side Park, to northern section of Central Park, along Amsterdam Ave. We used the subway and bus to visit the Cloisters farther north along the Hudson as well as as many of the more popular attractions "downtown". The location is right across the street from the M60 Select Bus Service (SBS) from/to LGA Airport - for us it was approx one hour ride; 55 minutes to airport in morning, one hour 20 minutes to apartment in mid-afternoon. The cost is $2.75 per person each way. Use Google to check MTA on to how to access and pay for the M60 SBS. Although the bedroom/bath area is small, we found it manageable as the room had a chest for storing clothing, headboard cubicles for the same and hallway hooks for hanging jackets, bags, etc. The hallway has a closet/hangars for items you want to store - also baggage can be stored there. Samuel provided room in the shared kitchen for refrigerated and frozen food, shelves in cabinets for dry foods. The kitchen contains the necessary cooking and eating - you just have to clean up after yourself. We used the kitchen for breakfasts by obtaining food items from the 24 hour grocery/deli just downstairs around the corner; the deli has a large variety of prepared hot/cold items from apps to salads, main items/meals to deserts. The kitchen has everything to prepare and serve what you choose. We found it to be just like home. Samuel also shares his dining room and living room, he is seldom present(but easily reachable via text/telephone as his work is nearby. We found these rooms to again be just like home; spread a map on the table to look for places to visit, couch and chairs to sit and read, converse or just relax. The tall, wide windows in both rooms make it light and cheerful. As to noise and disturbance there is none to very little. We slept soundly every night; BETTER than at home! An excellent home - we highly recommend this apartment. Great location for our NY visit! Samuel is a great host, his apartment is well kept and beautiful and in an excellent location. Comfortable, safe and close to subway! Samuel was a great host. We saw him when we needed to or coming and going. Shared space roomy and comfortable. Excellent, convienent and comfortable. We loved stay here. Felt right at home. Fabulous Find in a great neighborhood! Our host was kind and accommodating. His apartment is beautiful and quiet. While the bedroom is small it is comfortable and my wife and I both slept really well. The rest of the apartment is big airy with lots of nice light and we were able to use the entire apartment. The kitchen is well appointed and there is a large grocery store at the base of the building so we were able to make our own breakfasts and have ready snacks for late-night. We would DEFINITELY stay here again. It Is only a few blocks from the west side bike path. So we rented bikes and rode around the entire Manhattan. The west side is a lot better maintained and easier to navigate than the east side but well worth it. This neighborhood around Columbia University is safe with lots of great places for food/drinks. The 1 Line subway is only a block away takes you down into the heart of things downtown quickly and easily. Central Park is an easy 10-15 minute walk through nice neighborhoods. 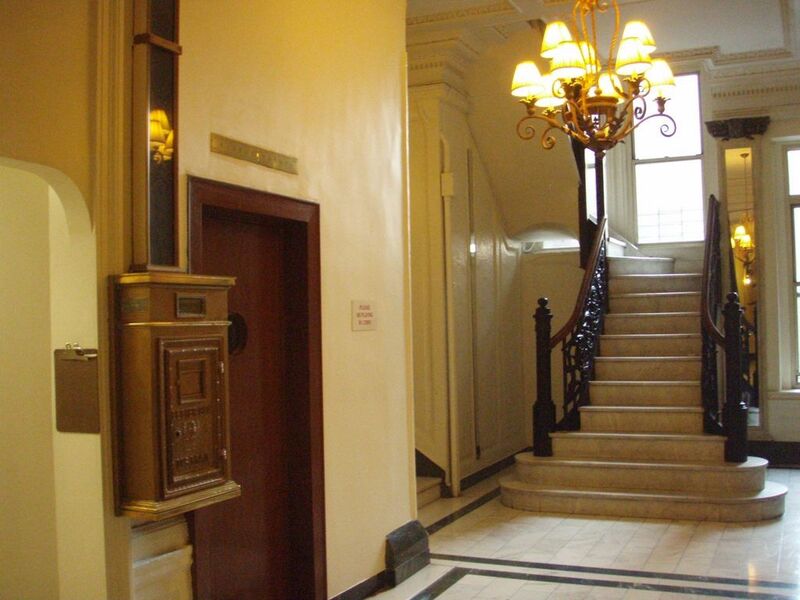 The building is well maintained and has a doorman during the evenings. The apartment is on the 7th floor so if you want exercise it is a nice walk up. Otherwise the elevator works well and we rarely waited more than a minute for the elevator. The apartment was very clean and had anything you would need.BTW, Seinfeld’s famous diner he and George always ate at “Tom’s Restaurant” is just down the street. Fun! A perfect alternative to paying a lot for a hotel room. The airplane tickets came first, so we booked our trip to New York City for the end of September. Hotel rates in August looked favorable, but when we put the actual dates into play, we got sticker shock. The whole idea of a NYC trip was we would be go-go-going all the time and not need to pay that much for posh lodging and services we wouldn't need or use. In talking with friends, they suggested VRBO and added we should READ the reviews carefully. That's how we took a chance and it paid off by our choosing to stay with Samuel. In sharing his apartment, we had a sufficient bath-and-bed setup and, when we wanted to spread out, could use the kitchen, dining and living room areas to our hearts' content. We're not usually the daring type, but Samuel made us feel comfortable all along the way. When we first got to his place, he greeted us warmly and got us acclimated to the apartment. After that, he left us to do our thing and kept tabs with us by text when it was necessary. The apartment is across from Columbia University and the neighborhood, Morningside Heights, has nice amenities and is a much calmer area from the steady buzz of lower Manhattan. The No. 1 subway and the M4 bus to Museum Mile both are a block away, so that's very convenient. The bottom line...we will be back again. Thank you Samuel for a great stay! Manhattan Central Park, Columbia University, Riverside Park, Upper West Side, Times Square. Restaurants, supermarkets, banks, underground, buses. LES FRAIS BANCAIRES SONT À VOTRE CHARGE. FRAIS D'ANNULATION: 300 EUROS POUR TOUTE ANNULATION. CECI EST VALABLE QUELLES QUE SOIENT LES RAISONS D'ANNULATION. Si je ne suis pas là à la date de votre arrivée, il y a 50 Euros de frais pour l'envoi des clefs. Les frais de ménage sont pour votre départ. Il n'y a pas de ménage de votre chambre pendant le séjour. Draps et serviettes ne sont pas changés lors de votre séjour. Vous avez accès aux produits d'entretien si vous le souhaitez et une laverie automatique est à disposition dans le quartier.